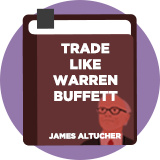 James Altucher Trading Below Cash is a bargain investing strategy loosely based on an approach described by US investor and writer James Altucher in his book, Trade Like Warren Buffett. This is a deep value strategy that Altucher found was highly effective in periods of market distress. He acknowledged that stocks that are priced at less than the value of their cash present a challenge to investors. It is difficult to get an accurate view of how much cash is actually in a business, plus they may have broken business models or dis-incentivised management. The strategy looks for stocks with a market cap below cash, low debt, sufficient cash to cover the annual burn-rate and some stability in revenues and earnings. Altucher wrote: "There is always the danger that management doesn't care about the shareholders but instead enjoys sitting on the assets of the company and using it for their personal benefit. Diversification is the tool that we can use to reduce the risk of corrupt, or at best, uncaring, management.? American hedge fund manager, author and blogger. In his book, "Trade Like Warren Buffett", Altucher indicates that his basket of stocks was up over 100% over six months, "as the market not only jolted upwards in the aftermath of the Iraq War but also began to realize the value of the cash portfolios of these companies". The long-term performance of this screen - and its performance in more benign market conditions - is unknown.